During this December 2010, the municipality of Saint Petersburg has been facing two challenges— both of natural causes. The first has been the nature of the local winter. When the temperature rises up towards 0°C and the sun shines, the snow on building rooftops melts, creating huge stalactites. Russians call them “sosulki”, a diminutive coming from lullabies: children sometimes use them as soothers. Yet, when these sosulkis reach up to half a meter in length and hang from 7-floor buildings over the sidewalks, they turn into killing machines. 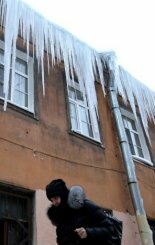 Normally, alpinist-looking workers would have destroyed these stalactites, but Saint Petersburg is hit with another almost natural calamity—it lacks the money to pay for this. Hence, the municipal authorities in charge of safety did the second best thing: they closed the dangerous sidewalk in question with red tape and posted a sign advising pedestrians to cross the street to the other sidewalk. A bit later, the weather still over 0°C, the stalactites have formed on the other side of the street as well. This fact hadn’t escaped the municipal safety personnel who promptly repeated the procedure. The result was that now both sides of many streets were closed. The inhabitants, after making some jokes about the inept municipal authorities playing Catch-22 with them, started simply to walk in the streets. Now, in these latitudes, the sun sets around 4pm in winter time. On December 15, a big garbage truck killed a two-year old girl who was being pulled on a sledge by her mother, who was gravely injured herself. Later that day, a 79 year old lady, a famous cardiologist, was killed in a similar accident. The reader may think that it is just in money strapped remote cities like Saint Petersburg that well intended bureaucratic measures lead to deaths—unless he learns more facts. We live in Paris, and it’s very very very rich—judging from the local taxes we pay— municipality decided to reduce traffic congestion by encouraging Parisians to use public transportation and discouraging them from using cars. Half of the streets were thus carved out to build bus lanes. After the works were finished, several boulevards looked like the following if you wanted to cross them: lane of cars coming from the left, lane of cars from the right, bus lane from the left, bus lane from the right (reverse order, if in London). Now, all people—including the Parisians—were taught as children that before they cross the street they have to look to the left and to the right and if there are no cars they can cross. That’s what they continued to do in the new boulevards. Dozens of people, particularly old ladies, were hit by buses coming in the lane from the left. Many died. Even we were almost hit by a taxi driving in the bus lane—luckily for us taxis, unlike buses, can press the breaks to the halt. The reader may think that it is municipal bureaucracies who are particularly suffering from good intentions turning into deadly unintended consequences. Unfortunately, the unintended deadly outcomes are legion from the bureaucracies at all government levels and corporations alike all over the globe. When measures are driven by well-meaning intellectual schemes and bureaucratic procedures while the common sense is ignored, people perish.